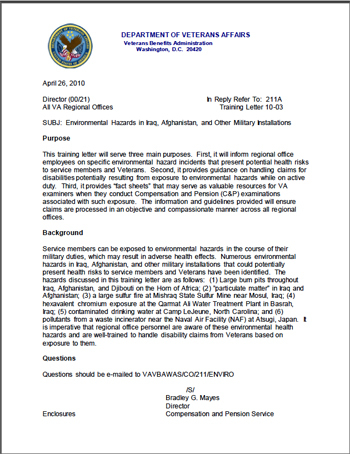 Training information and guidance on exposure to particulate matter “in Iraq, Afghanistan, and Djibouti” was provided by the Department of Veterans Affairs to all VA Regional Offices in 2010. It’s important for veterans who were affected by particulate matter during active duty service to know how the VA is guiding its employees to handle the associated claims. General Information: “Particulate matter” (PM) is a complex mixture of extremely small particles and liquid droplets. PM is made up of a number of components, including acids (such as nitrates and sulfates), organic chemicals, metals, and soil or dust particles. Although PM emissions from natural and manmade sources are generally found worldwide, the PM levels in Southwest Asia are naturally higher and may present a health risk to service members. There are generally two size ranges of particles in the air that are a health concern. These include particles with a diameter less than or equal to 10 microns (PM10) and those with a diameter of 2.5 microns (PM2.5) and smaller. The size of particles is directly linked to their potential for causing health problems, with the smaller particles being considered more harmful. Particles that are 10 micrometers in diameter or smaller are the particles that generally pass through the throat and nose and enter the lungs. Once inhaled, these powder-like particles can affect the heart and lungs and cause serious health effects. Most studies relate PM exposure data to respiratory and cardiopulmonary health effects in specific susceptible general population subgroups to include young children, the elderly, and especially those with existing asthma or cardiopulmonary disease. Many variables influence the nature and probability of health outcomes. The key variables are the size-fraction and chemical make up of the PM, the concentration levels, the duration of exposures, and various human factors to include age, health status, existing medical conditions, and genetics. These variables combined with scientific data gaps limit the medical community’s ability to estimate health impacts to relatively healthy troops. Another key factor is that most studies have been on older or less healthy groups. Several studies to determine potential health effects/outcomes are currently underway. DoD collected approximately 60 air samples at Balad from January to April 2007 and assessed for PM. The samples were taken from five different locations around Balad. The heaviest measured concentration of PM was taken in April 2007—the concentration level was 299 ug/m3 of PM10 sized particles. In total, 50 of the 60 samples registered above the military exposure guidelines. Although a Veteran who is claiming a disability may not specify the source of exposure as PM, employees handling such claims should be aware of PM exposure and its potential health effects. In certain cases, a statement of exposure may be appropriate to include in VA examination/opinion requests. In all cases involving PM exposure and potentially related disabilities, regional office personnel should ensure that the attached fact sheet is included with C&P examination/opinion requests. As C&P Service becomes more aware of the concentration levels of and health outcomes from PM exposure in Iraq and Afghanistan, we will notify regional office personnel accordingly. You may download a copy of the Particulate Matter Fact Sheet, which is part of the VA’s April 26, 2010 letter to its Regional Offices, here. You may download a copy of the U.S. Army Public Health Command Fact Sheet on particulate matter here.